This branding iron is a unique and fun gift. The 15" long, stainless steel branding iron features a wood handle, perfect for the palm of his hand. Personalize the tip of the iron with a steel, two-initial monogram with iron letters measuring 3/4" tall. Please put your two initials in the comment box below in the order that you want them made. � Production time is 10 days. Clapboard Key Chain 3 3/8" clapboard key tag has a movable clapper. Choose personalized or non-personalized. 12 business days to personalize. Please put personalization in the comment field below. Price is per clapboard keychain. 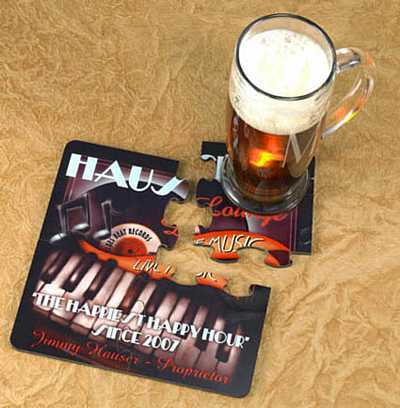 Personalized coaster puzzles will add some whimsy to your barware with our entertaining Coaster Puzzles. Available in a variety of designs, these unique coaster puzzles separate to become four handy coasters. 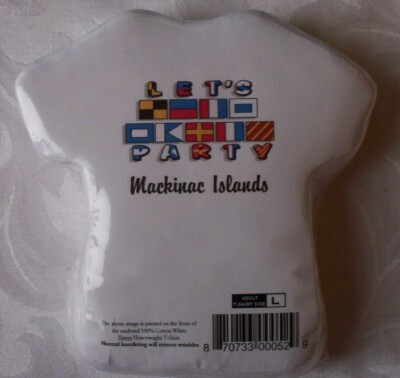 Perfect for party or everyday use, our coaster puzzles include your choice of personalization. Great gift for the executive or retiree! Measures 7 1/2" x 7 1/2" x 1/8". Price is per coaster puzzle, which separates into 4 individual pieces (coasters). Ships in 2-3 business days. Click here to view designs. Add personalization in the comment field below. These designer personalized playing cards are great gifts for your guests. This is something that will be used over and over. There are several colors and so many designs to choose from. These designer personalized playing cards are great to give to families or individually. Write the personalization information (Names & Date) and also the design number in the comments field below. The design number is located in the bottom right corner of the card design. ~2-1/4" x 3-1/2" There is a one time $15 set-up charge. The personalized cards are packaged in tuck boxes w/ a die cut window front to show card design. Minimum order is 50 decks. No PMS color matching. Please keep in mind that there may be shade variations from lot to lot. Proof is sent in a week via fax. 3-5 weeks for production after approval. Price is per deck of personalized playing cards favor. Price is not $0. Prices are based on quantity ordered. Prices are listed in the pricing drop down box. You must select the correct pricing based on the quantity you order. If you do not, your order will not be processed and you will not be contacted about it. Lottery Ticket Holders The 6 1/2" x 5", white cards are available blank or personalized with, "Wishing you the best of luck from both of us" along with your names and wedding date. All copy will be printed in the ink color you select. Lottery tickets not included. Put personalization information in the comment field below. First names and date. 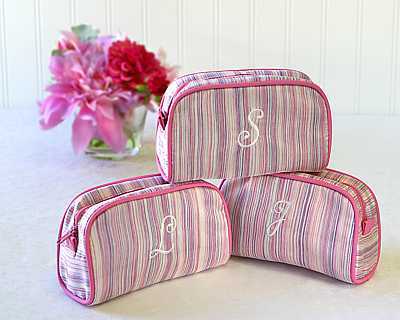 These mini pinks and lilacs striped initial bags are very versatile. It's fully lined for messy make-up protection and features a matching pink zipper. The squared-off bottom allows the bag to stand easily and the nylon fabric shimmers like silk, but cleans up quickly. Embroider these bags with your girlfriend's initials for a thoughtful, useful bridal shower gift. Even if you already have bridesmaid's jewelry or another small gift picked out, what better way to present it then in charming, reusable "gift wrap" like this? These are also great for out of town guests. You can put travel sized toiletries in each bag. Measures approximately 6.5 inches across by 4 inches tall. The following letters are not available at this time: Q, U, X and Z. Price is per mini initial bag. These monogram sugar cubes are perfect for bridal shower tea parties and birthday parties. They are also great to give as gifts. The monogram sugar cubes are packaged in sets of 10. They are hand decorated and a delightful touch. Minimum order is 3 sets. You can mix letters if you need to, but they will have to be the same color. Price is per set of 10 cubes. These initial coasters are great for showers, receptions, parties, and corporate events. The monogram coasters feature a centered single initial in gold with mini gold initials (the same single letter) in the background. These also make great gifts! 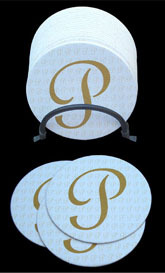 The monogram coasters are chipboard are packaged in a clear plastic container. The price is for a package of 50 initial coasters. These cute personalized "records" are really cds that resemble the nostalgic vinyl records. You can make your own album. These will be a big "hit" at your next event. They are great for baby showers, bridal showers, weddings, anniversaries, and so much more. Old school mixed with new school. The cds are blank. You can make your own old school or new school mix. You can even do voice recording and use them as invitations. Just burn them as you would any cd. There are 3 different designs to choose from, and several colors. If you want us to put your playlist on them, just enter the information in the comment box below as you would for any of the them. Please let us know position of personalization. eg., Top: Gerald & Vanessa, Bottom: September 16, 2006, Right: Thanks for sharing this day. Left: Have a great time. Please make sure that you check your spelling. We will print it exactly as you have it spelled. Price is per personalized "record". Minimum order is 25. Price includes plain white paper cover. These are not in jewel cases. Please note that the labels will be formatted as shown for each design. Please enter your personalization accordingly. Personalized Barbecue Sauce Yippi, personalized barbecue sauce! Give guests a favor with delicious down-home flavor! 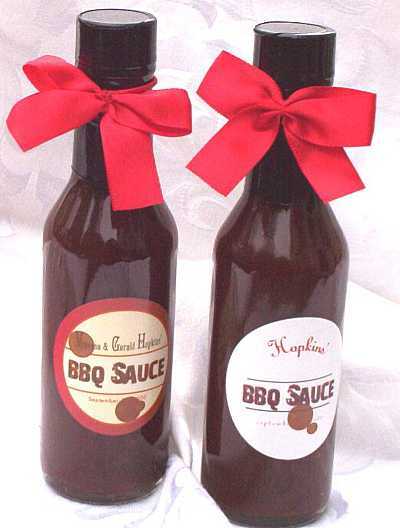 Personalize these bottles of award-winning BBQ sauce as shown with your new last name and wedding date or names and date -- everyone will think it's your own special brand. Created by head chef Michael Orr of the exclusive Palo Alto Club. 5-oz. security-sealed bottles. 6 1/2" h. Case of 12. Price is per 12 bottles of personalized bbq sauce. Labels will be shipped separately. Simple assembly required. Ribbon not included. Put your personalization in the comment field below. Personalized candle tins are a practical way to thank your guests. 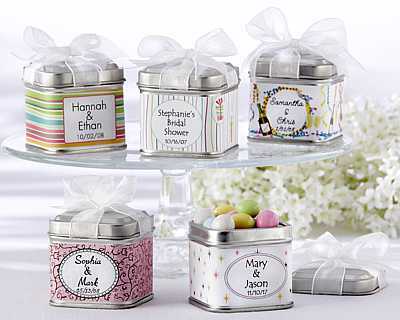 Personalized candle tins are perfect for bridal shower favors as well as wedding favors. There are 3 different scent/colors to choose from. Lime/citrus, white/vanilla-hazelnut, lavender/lavender. Each measures ~2" and burns up to 12 hours. 1 week lead time. Labels are clear. 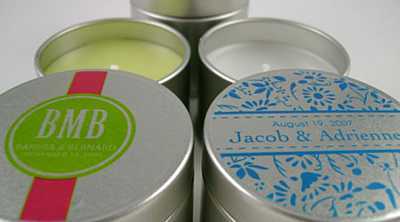 Minimum order is 15 personalized candle tins. Price is per personalized candle tin. Please put your personalization in the comment field below. Please note the label design. The designs can't be change. These wooden personalized chopsticks are perfect for your Asian themed event. They are just great to have. Enjoy the time-honored tradition and pleasure of utilizing these fine wooden chopsticks. They can be personalized with the same or different message on each individual chopstick. The chopsticks are 9"L. Minimum order is 12. Price is per set of 2 personalized chopsticks. You can add a wooden box for additional cost. Add your personalization in the comment field below. 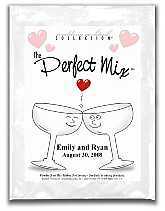 These personalized cocktail mixes are perfect for any event. Drink mixes are the hottest thing now. Each 11 gram packet is a single serving. Each packet is a white gloss, 3.75"w x 5"h pouch. You can have 2 lines of imprint, 25 characters max for each line. Ships within 1-4 business days. Minimum order is 50. Price is per personalized cocktail mix. pack. Drink choices are Cosmopolitan or Margarita. Your guests will have fun guessing the mysterious surprise they�ll find within these adorable and customizable �Unexpected Treasures!� personalized favor tins. You�ll have fun choosing what goes in them and on them. Fill your tins with anything you�d like�mints, chocolates, potpourri, your vows or seashells to complement a beach wedding. Then personalize each favor to express your theme, the season or your own trendsetting style with a choice of 40 distinctive covers that wrap around the tin. Whether upscale, trendy, fun or traditional, you�ll find the perfect design for your Vegas nuptials, or your wine-themed wedding, or your ceremony by the sea and every possibility in between. The pleasure is all yours! The 1.75�-square tin comes with a sheer organza bow pre-tied to save you time as you prepare for your event. Sold as a set of 12 and some assembly required. Please add your personalization in the comment section below. Price is per set of 12 personalized favor tins. The tins are empty. Personalized gift wrapping paper is the perfect touch to a beautiful gift. There are several colors of personalized gift wrapping paper to choose from and several imprint colors to choose from. This is really wrapping paper and not copy paper. The personalized gift wrap is personalized with your own personal message. What a cute and novel idea. This personalized wrapping paper is perfect for wrapping bridal party gifts from the new Mr. & Mrs., Christmas gifts, birthday gifts, and other holiday gifts. Price is per 12 ft roll or 24 ft roll of personalized gift wrapping paper. 15 to 17 days lead time. May be longer during peak holiday seasons. Rush service is available. Please add your personalization to comment field below. Please check your spelling. It will be printed as you write it. 37 Characters Maximum. Also, please double check your shipping address. No PO Boxes. From October through December 17th, the rush fee is $50. Your paper will be shipped within 3 business days. 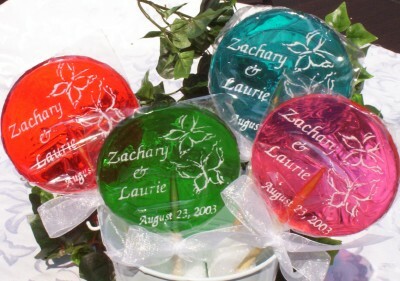 Personalized Hard Candy This custom hard candy has been featured on several wedding shows. This the perfect unique favor. 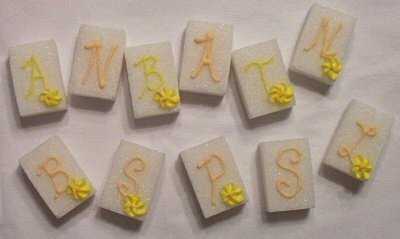 The personalized hard candy is hand made and cut by hand. You can place your name, theme, or symbol in the candy. There is a back side and front side of the candy. The minimum order is 50 pounds. We have already asked the question and the answer is no. Nothing less than 50 pounds. You must order in increments of 50 pounds. The price is per fifty pounds. There are ~70 pieces of individually wrapped personalized hard candies per pound. We have given you several standard design options, but if you have one that is not listed, please email it to us to see if it can be put into the candy. Keep in mind that this is a hand made candy and not machine made. Images are not going to be symmetrically perfect. 2 week lead time before it ships. Call if you need it sooner. This is an excellent wedding favor. We suggest using favor boxes or bags to give your guests more that one in order to utilize all 50 pounds. Up to 16 letters, Upper Case Letters. If you want more than 16 letters or lower case letters, there is a $40 charge per request. If you would like more than one color or custom design, please include that information in the comment section below when you enter your personalization information. 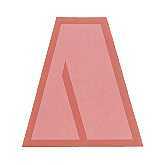 1" D, ~.33"thick (hand cut so thickness will vary) Remember, price is per 50 pounds. Flavor, color/colors, designs, etc. will be the same for the 50 pounds. 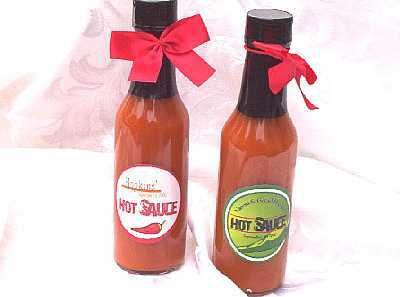 Spice up reception tables and have guests take home a warm taste from the party with these favor bottles of personalized hot sauce. Tell us your new last name and date or names and date, and we'll create labels that look like your own special brand. Each 5-oz. bottle of habanera hot sauce is security sealed and measures 6 1/2" h. Sold in a case of 12. Price is per case of 12 personalized hot sauce. Ribbon not included. Simple assembly required. Labels ship separately. These personalized lip butters are perfect for bridal showers, bachelorette parties, wedding favors, and girls night out. 100% natural and hand-poured, the lip butter is hand made and hand poured in the USA using only six ingredients derived from nature: sweet almond oil, coconut oil, beeswax, cocoa butter, Vitamin E and flavor oil. This product is not tested on animals. They come in four flavors: vanilla, plum-berry, cucumber-melon, and latte. All lip balms measure 1.5" W X 0.75" H and are filled with 1.75 oz of lip balm. Actual label size is 1.2" diameter. Price is per personalized lip butter favor. Minimum order is 12. Ships within 5 business days. Please enter your personalization in the comment field below. 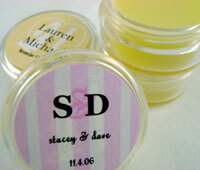 Personalized lip gloss is a great baby shower favor. They are useful and cute. Lip gloss is a really popular product, especially in the colder months. Includes: Tin with lip balm, Ribbon, Tulle (Tin, Tulle and Ribbon are not assembled) and Personalization - Please note how the personalized lip gloss tins are personalized. Not all allow dates. They will be personalized as shown, even if you enter more information. The additional information will not be included. Put your personalization in the comment section below. Flavors: Tropical Island Kiss, Strawberry Vanilla, Mango, Peppermint Lemon Grass Size: 1.5" x .5" Minimum order: 12 pieces Price is per personalized lip gloss tin. 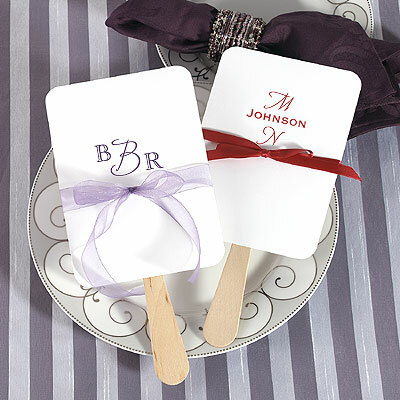 These really nice personalized lollipops are great for any occasion. 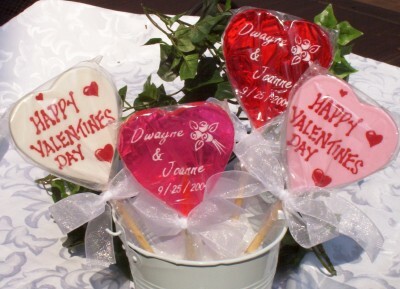 The personalized hard candy lollipops are handmade. They are personalized with your names and date and a design! 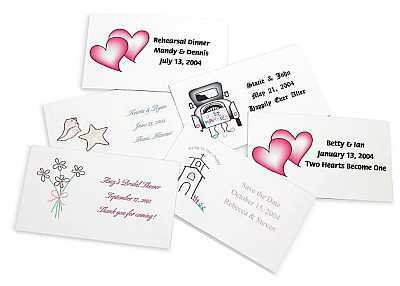 All personalization is in white or red for the solid pink and white. You can choose one of our standard designs or send us your own. If you have a certain design that you are using on your invitations and napkins, you can email us the artwork and we may be able to use it. It must be camera ready and you have to send us a clear black and white picture file. The personalized lollipops are 4"diameter. Make sure that your artwork fits accordingly. You can even let us know what font you would like. If we have it we can use it or just send us a picture file of your personalization. The personalized lollipops are individually wrapped. 2 week lead time before they ship once we have completed artwork. There is a one time set-up fee of $20. Minimum order is 100. Ribbon is not included. Price is per personalized lollipop. Put your personalization in the comment field below or email your personalization in jpg format. Let us know if want a script or block print and the design if you want us to design. These really nice personalized lollipops are great for any occasion. The personalized hard candy lollipops are handmade. They are personalized with your names and date and a design! All personalization is in white. You can choose one of our standard designs or send us your own. If you have a certain design that you are using on your invitations and napkins, you can email us the artwork and we may be able to use it. It must be camera ready and you have to send us a clear black and white picture file. The personalized lollipops are 4"diameter. Make sure that your artwork fits accordingly. You can even let us know what font you would like. If we have it we can use it or just send us a picture file of your personalization. The personalized lollipops are individually wrapped. 2 week lead time before they ship once we have completed artwork. There is a one time set-up fee of $20. Minimum order is 100. Ribbon is not included. Price is per personalized lollipop. Put your personalization in the comment field below or email your personalization in jpg format. Let us know if want a script or block print and the design if you want us to design. Personalized Magnets II These personalized magnets make cool save-the-date mementos, and favors for the bridal shower, rehearsal dinner, and the wedding reception, too. Personalize with up to three lines of text (21 characters max/line) in one of two font styles in your choice of blue, green, lavender, burgundy, or black ink. Choose from six classic motifs to suit your occasion (Cocktail, Bouquet, Hearts, Going to the Chapel, Seashells, or Just Married). Each motif is available in a single solid color (blue, green, lavender, or burgundy), or as a 4-color option. Pack of 10 personalized magnets. Each white magnet measures 3 1/2 x 2". Price is per pack of 10 personalized magnets Add personalization and font style in the comment field below. Print or Script. Finally! Something they can actually use! These handy little personalized notebook wedding favors are perfect to slip into a purse or car. Just when they ask, "where is that pen when you need it?" they'll find your useful gift and remember your special day. 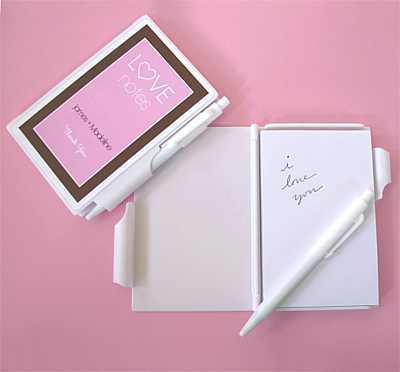 Aside from its practical use, each comes personalized with your choice of color and a sleek design labeled "LOVE Notes," complete with your names and date. Each white notebook opens up to reveal a blank white notepad inside, and the white pen conveniently holds everything together in one place. 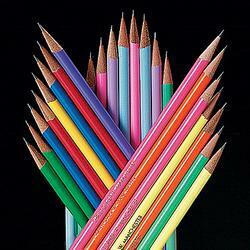 Price includes notebook with pad, pen and personalization. Price is per personalized notebook favors. "Love Notes" Notebooks arrive separate from the labels, some assembly required (attaching the self-stick labels to the notebooks).